SupersizedMeals.com - Fight climate change, cut down on red meat? Fight climate change, cut down on red meat? They're kidding, right? Cut down on Supersized Burgers? Insane! Maybe we just have to eat less burgers during the week, and save them up for a Megaburger on the weekends! Yeah, that's the solution! PEOPLE in rich countries should limit their meat-eating to the equivalent of one hamburger per person per day to help stave off global warming, an Australian-led study in the Lancet suggests. That would be their contribution to a proposed 10 per cent cut in global meat consumption by 2050, a goal that would brake greenhouse-gas emissions from agriculture yet also improve health for rich and poor nations alike, it says. 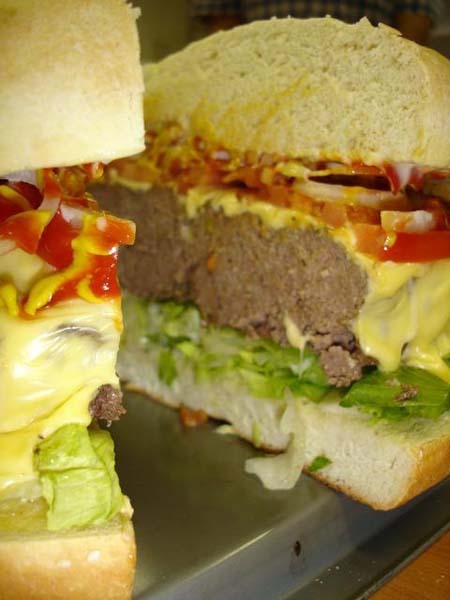 A closeup of the Megaburger. I could handle only having one of these a week! The paper has been released online as part of a seminar by the British medical weekly into the impacts of climate change on global health. Its authors point out that 22 per cent of the planet's total emissions of greenhouse gases come from agriculture, a tally similar to that of industry and more than that of transport. Livestock production, including transport of livestock and feed, account for nearly 80 per cent of agricultural emissions, mainly in the form of methane, a potent heat-trapping gas. At present, the global average meat consumption is 100g per person per day, which varies from 200-250g in rich countries to 20-25g in poor countries. The global average should be cut to 90g per day by 2050, with rich nations working to progressively scale down their meat consumption to that level while poor nations would do more to boost their consumption, the authors propose. Not more than 50g per day should come from red meat provided by cattle, sheep, goats and other ruminants. The authors were led by Anthony McMichael, professor at the National Centre for Epidemiology and Population Health at the Australian National University, Canberra. "Assuming a 40 per cent increase in global population by 2050 and no advance in livestock-related greenhouse gas reduction practices, global meat consumption would have to fall to an average of 90 grammes per day just to stabilise emissions in this sector,'' the paper said. According to a study published in July by Japanese scientists, a kg of beef generates the equivalent of 36.4kg of carbon dioxide, more than the equivalent of driving for three hours while leaving all the lights on back home.